If you’re looking for some rest and relaxation by the sea shore, an adventurous hike to a scenic peak or a sampling of international cuisines, the Russian city, which is closer to Tokyo than Moscow, can satisfy all your desires. Before the oil and gas boom on Sakhalin Island, Yuzhno-Sakhalinsk (6,650 km from Moscow) was nothing but a small provincial town with almost a village-like atmosphere. The boom brought with it an international mix of expats and with them a new concept of dining out and eating pasta, chicken tikka or sushi. Sakhalin’s unique selling point though is its nature and a weekend in its capital can give you a mix of nature and city life. The building housing the museum (29, Kommunistichesky Av) was used as the administrative headquarters of the Japanese, who ruled the southern half of Sakhalin from 1905 to 1945. 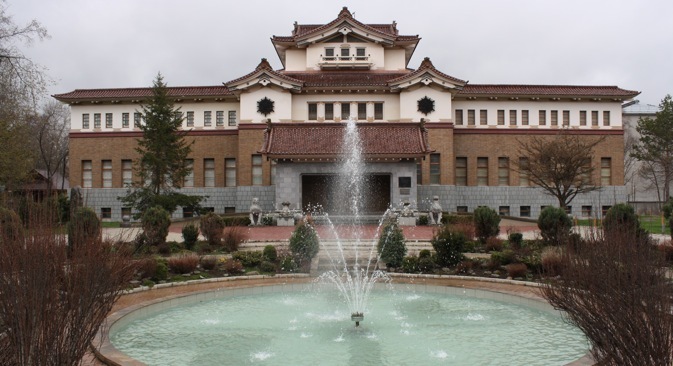 It is a unique example of Russo-Japanese architecture and an attraction in itself, but make sure you visit the museum as well. There is a good collection of natural and historic artefacts from different parts of Sakhalin Island and the Kurils. Sakhalin Island has 16,000 lakes, and a few of them are close to Yuzhno, as the locals call the administrative capital. The large Tunnaicha Lake is one of the largest in southern Sakhalin and is in tranquil surroundings. Nearby is the Izmenchivoe Lake, which is separated from the Sea of Okhotsk by a very narrow stretch of land. The sandy beaches by the Sea of Okhotsk are a great place to relax and take in some sun, but the waters as tempting as they may look, are freezing cold. In the warmth of August, the temperature of the water is around 10 degrees above zero. Gorny Vozudkh (mountain air in Russian) is one of the premier ski resorts in the Russian Far East and is very popular with skiers and snowboarders across the region in the winters. It’s also a nice place to get a panoramic view of the city all year round. Take the cable car up to the top to get a great view of the city that lies on a valley. If you’re looking for great dance music, good DJs and a nice dance floor to shake your body with the younger generation, Duke, at the Mega Palace Hotel (4, Detskaya St) would be your best bet in Yuzhno. For those of you looking for a more “traditional” Russian nightclub and want to be in the company of relatively older adults, try Za 30 (83 Mira Av), a nightclub which doesn’t allow in anyone under the age of 30. To be truly considered a citizen of Yuzhno-Sakhalinsk, it is a must to climb Chekhov’s Peak, which stands at 1044 metres above sea level. Watch the vegetation change from a thicker sub-tropical forest with local bamboo to a clearer and alpine forest on top. There are several small streams from where you can drink the cleanest possible water. The peak on a clear day offers stunning views of the Tunnaicha and Izmenchivoye lakes as well as certain capes. It’s not an easy hike but even pensioners who are reasonably fit can manage. The city’s central park is one of the largest in the Russian Far East and leads straight into the taiga. There’s a small amusement park and a zoo within its premises as well as a toy train. You can also take a long stroll on some of the wooded paths. If the hike to Chekov’s Peak took away all your energy, sit back by the lake and take in the peace of a summer evening. There are also many stalls where you can get shaslik or Russian kebabs. Residents of Yuzhno-Sakhalinsk are very proud of the city’s Chekhov centre (Kommunistichesky Av), a premier venue for plays and concerts. There is a very active theatre scene in the city and it’s worth catching some of the island’s most talented performers on stage. Originally meant to be a place where expats in the oil and gas industry come for a drink or two after work, this pub (85 Chekhov St)is a great place to have some burgers and fries over a couple of pints. It’s not very crowded on a Sunday and after an action and adventure-packed weekend, a nice place to soak in everything experienced on the island. (Dinner and drinks here would cost around 1000 roubles per person).